Aina Pascual: She has a degree in philosophy and literature, specialising in art history (UB and UCM), and is a founder of the Association for the Revitalisation of the Old Town Centre. She is also a member of the Luliana Archaeological Society and the Royal Mallorcan History Academy and received the Jaume II Award in 2010. 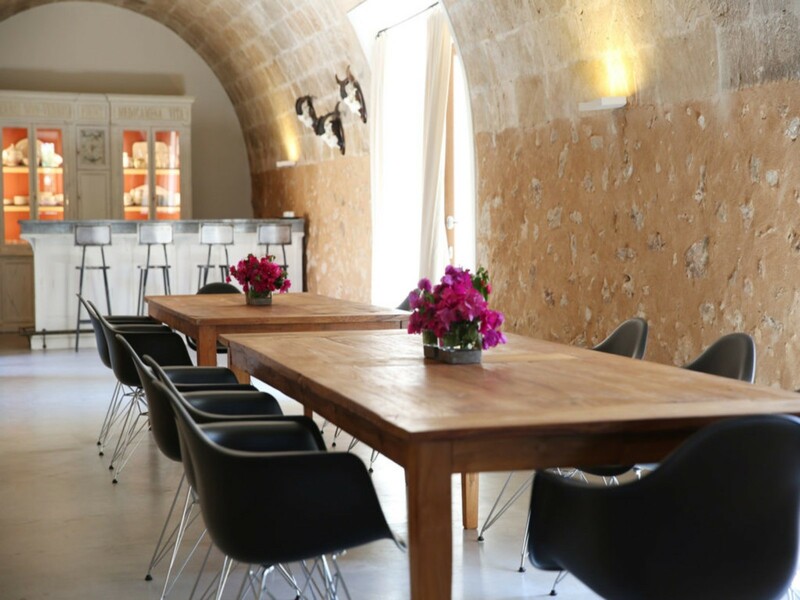 Aina provides extensive knowledge of the architectural and rural heritage of Mallorca. Tomás Vibot: Philologist, author, researcher and cultural guide. He has a masters degree in Balearic studies and works with the Balearic Islands University, as well as a member of the Valencia University Educational Innovation Network “Literary Geographies 3.0”. He is a speaker at rural heritage events and worked on the candidacy of the Serra de Tramuntana mountains as a World Heritage Site (UNESCO). His key contribution is his identification with Mallorcan history, in which he is one of the greatest experts. José Villalonga: A researcher with a degree in history, he supports the Itinerem Foundation in his speciality area of the design and evolution of agricultural operations. He is co-author of several works and has participated in seminars and workshops on the creation and evolution of major farming estates. He is an expert in the rural history of Mallorca. Tomeu Caldentey: Tomeu was the first Mallorcan chef to receive a Michelin star for his Es Molí d’en Bou restaurant. He is currently working on “Tomeu, Mallorcan Chef, restaurant”, a new project in which he combines his natural creativity with the roots of traditional Mallorcan cuisine. He is extremely committed to innovation and supports us by designing culinary experiences based on traditional rural cuisine. Tomeu Arbona: He is what could be described as a “culinary archaeologist”. Why? Because in his El Fornet de la Soca bakery he retrieves forgotten recipes and writes books on ancient cuisine. He has been named Pastry Chef of the Year by the Association of Culinary Journalists of the Balearic Islands and also received the December 31 Award from the Balearic Cultural Association. He is a great help to us in designing activities based on ancient cuisine. Antoni Tugores: He is a Mallorcan author, historian, researcher and journalist and also one of our cultural advisors. He has written numerous biographies and books on cuisine, among them “Memories of Mallorcan cuisine: ancient recipes from all the villages”. He received the Gourmand World Cookbook Awards in 2010 in the category of home cooking in Catalan for his book Economic cuisine. Leonor Amengual: she is a tourism marketing and digital marketing specialist and supports Itinerem in the design of differential experiences. She has more than fifteen years’ experience in tourism sales and was a member of the Board of the Mallorca Convention Bureau between 2011 and 2017. She has a background in social media (UOC) and online travel marketing (UIB). Jaume Llabrés: is a researcher, author and co-author of works on Mallorcan heritage such as “Gardens of Mallorca. Tradition and Style”, which catalogues more than thirty historical gardens in 18th to 20th century Possessions. He has received the Jaume II Award and helps us design cultural activities. Magdalena Sureda: She is a graduate in tourism studies at the Balearic Islands University and Official Tourist Guide for the Balearic Islands. Since 1996, she has been providing services to the German market and supports the Itinerem Foundation in the same. She has participated in programmes such as “The Courtyards of Palma”, “Monumental Palma” and “The Jewish Quarter”, among others. Javier Sánchez: He has a masters degree in environmental management and is a promoter of the “Wool Routes” and creator of the “European Cemeteries Route”, which was named “Best Innovative Tourism Product” in 2011 by the WTO. He is also the coordinator of Turinea, a marketing platform offering more than 460 themed routes. Javier assists us with the preparation of our candidature for Cultural Route of the Council of Europe. Martín Breuninger: He studied political science at the Freie Universität in Berlin and is passionate about culture. He is the co-author with Germá Garcia i Boned, of Mallorcas vergessene Geschichte, a book about the German colony in Mallorca in the 1930s. Since 1986 he has been working as a press and radio journalist and coordinates the culture section of the German-language weekly magazine ‘Mallorca Magazin’. He organises classical music events and supports us in the design and publication of cultural activities, especially for foreigners living in Mallorca. Ingrid Flohr: from Nuremberg in Germany, Ingrid is an artist that has lived in Majorca for more than 20 years. Since she arrived on the island, she has worked at the Fine Art Gallery in Cas Concos in Felanitx and has also organised art events. In 2007, she opened the Flohr Gallery in Santanyi where she now organises exhibitions by international artists. Ingrid coordinates the promotion of our cultural activities to foreigners living in Mallorca.